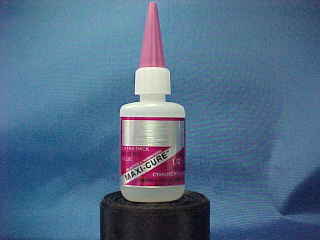 "Insta-Cure" is our most popular CA Glue. 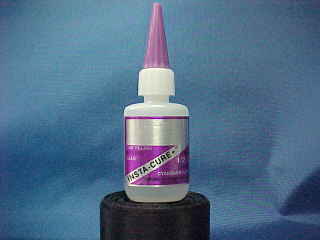 INSTA-CURE™ has a water-thin viscosity that wicks deep into joints by capillary action and cures in a matter of a few seconds. Surfaces to be bonded must be tight fitting and should be held together while you apply the CA around the edges of the seam. At the moment CAs cure, they give off a vapor that can irritate the nose and eyes, so be prepared. INSTA-CURE+™ is a higher viscosity CA for loose fitting joints in which the adhesive must bridge gaps. Normally, the thicker CA is applied to one surface and then the parts are held tightly together for about 5 to 15 seconds. For large surface areas, including those with close fitting joints such as laminations, INSTA-CURE+ ™ should also be used. To prevent premature curing, dont spread the glue into a thin film. Lay down a serpentine bead with about 1" separations on one surface, then assemble the parts, letting the pressure spread the CA out. MAXI-CURE™ extra thick CA is the best CA for most plastics. When used with INSTA-SET™, it works better than any putty for modifying or filling voids. It can be carved with a knife or razor blade and sanded and feathered to form a finish indistinguishable from plastic. INSTA-SET™ is a catalyst which acts as an accelerator that allows CAs to quickly cure in thick layers by enhancing the alkaline conditions during polymerization. 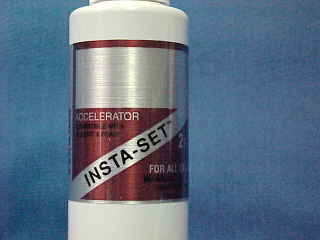 INSTA-SET™ in a spray bottle is normally used to cure the CA that flows from joints when parts are pressed together. Applying an additional bead of thick CA along a seam and then curing it with INSTA-SET™ significantly enhances a joints strength. For difficult to bond materials, INSTA-SET™ can be applied to one surface and CA to the opposite surface. When brought together, they will bond instantly. INSTA-SET™ is formulated with a strawberry scent and activates CA in 6 to 8 seconds without any degrading of the CAs strength, which can occur with many other accelerators. It is compatible with all surfaces, even clear plastic and white foam. How To Use Cyanoacrylates: Heat and moisture will decrease the shelf life of CAs. Unopened bottles can be stored in a freezer or refrigerator, but allow them to reach room temperature before using. Keep your bottles in a cool place that wont be exposed to direct sunlight and store away from bottles of accelerators. Due to the freshness of our CAs, their shelf life is guaranteed for 12 months. For the initial opening of the top, loosen and retighten the top first to relieve internal pressure, then hold the bottle against a near vertical surface and cut off the top 1/32" with a knife or razor blade without squeezing the bottle. To prevent clogging, do not let the tip of the nozzle touch a surface that has been sprayed with INSTA-SET™. Before replacing the colored cap, set the bottle down hard to knock the remaining CA back into the bottle before squeezing it in an upright position to blow air through the nozzle, then wipe the tip clean. With all CAs, the closer the parts fit together, the stronger the bond. Always hold the bonding surfaces together as tightly as possible. Any rough spots on the mating surfaces should be smoothed out. Although CAs will hold objects together with considerable strength within seconds, the full strength of the bond is not reached for several hours. Allow for this before subjecting parts to maximum stress. Also, CAs are generally a little less brittle and have higher strength when they are allowed to cure on their own.